A career in emergency communications is among some of the most rewarding work one can undertake. 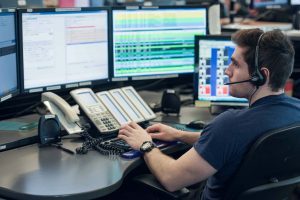 Call takers, and their colleagues in dispatch, are known as “the first, first responders” – recognizing the essential role they play in emergency response. It takes a special person to do this kind of work. Before you take the next step in applying, consider these questions to find out if working in this field is the right fit for you. If it is, and you join our team, we will help you be successful in helping to save lives and protect property. Does my lifestyle align with E-Comm’s core values: respect, accountability, integrity, service and collaboration? Do I have a support system and self-care strategies in place that will help me cope with a busy job that puts me in direct contact people in distressing situations who are counting on me to help them? Do I get along well with coworkers and am I able to work harmoniously in close quarters? Do I have a strong commitment to customer service and motivation to serve the public? Work in a busy call-centre environment that can get loud at certain times of the day, with both expected and unexpected ups and downs in call volume? Work a regular rotating 12-hour shift schedule (two day shifts / two night shifts / four days off)? Spend the first nine months of your employment in a probationary status, during which you have training both in classroom and on-the-job, learning from feedback through mentoring, coaching and evaluation? Learn in a variety of settings (classroom, self-study, online and on-the-job)? Learn all facets of a multi-tasking job: call-/complaint-taking, automated data entry and transfer and law enforcement inquiries? Accurately input information as it is being received and asking further probing questions to obtain more information? Work in a collaborative environment with supervisors and coworkers? Deal calmly and professionally with citizens regardless of their reason to call? Help every caller, free of judgement, stereotype or discrimination? Listen to abusive/profane language (at times) and not let it impact how you handle the call? Deal with a vast variety of crisis calls and maintain the same level of excellent service? Ask for help when you need it?